Today's post is inspired by an engineer, details of which I'll get to later. Energy is the future. Our future depends on energy. Many people in the developing world spend much of their time thinking about and acquiring it. Firewood and food. Most people in the developed world spend little or no time thinking about or acquiring energy. An apparently endless supply of energy is assumed to be as certain as the sun rising tomorrow. Only a tiny proportion of us even consider this assumption, let alone question it. 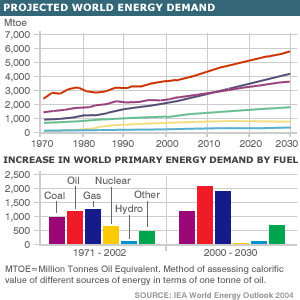 And yet oil, gas and coal are finite and will run out (at least in economically significant and useful quantities). The end of cheap oil will arguably occur within a few short decades, if it is not already upon us. When I was at school I remember being told that oil would run out in a few decades. I remember feeling vaguely concerned, until it occurred to me that people much smarter than me must be working on it and would have a solution soon. A few decades later I am wondering where these people are. The answer of course is they live amongst us. Engineers, economists, bloggers, scientists, activists, and entrepreneurs. And yet at the moment most are not focused on solutions to our energy challenges, because many are not aware there is a problem. Much of the mass media promotes materialism with shows such as MTV Cribs showing bigger and bigger houses with garages full of cars. Indeed here in the UK there seems to be one channel whose non-music programming is made up almost entirely of half hour shows titled "the fabulous life of" which seem dedicated to the worship of conspicuous consumption. Most of our politicians seem dedicated to the "not in my term" mentality. And yet despite our general lack of awareness, despite the scale of the challenges, the potential payoffs for coming up with solutions are huge. For the companies and entrepreneurs who bring solutions to market there are bound to be significant financial rewards. Beyond this there is the prospect of a more peaceful world. I'm not proposing a utopian vision of a world where everyone lives in perfect harmony. However it is pretty easy to predict that having people compete over scarce resources is likely to result in conflict. Clean renewable energy offers the prospect of countries spending more time cooperating to harness the power of the sun, wind and ocean and less time competing over finite resources. If the developed world stands to benefit from this, the developing world has even more to gain. Rather than experiencing the dirt and pain of industrialisation, renewable energy may allow them to leapfrog ahead. As individuals it is time to become aware of our energy usage and its implications. Make our homes more energy efficient, switch to a renewable electricity supplier, generate some or all of our own power using means such as solar panels or mini wind turbines. However it is not enough to act just as individuals. For humanity to move forward it is not about being more virtuous than everyone else. It is not about pointing fingers and assigning blame to drivers of certain types of car, people of a particular political affiliation or even to whole nations and continents. It is about building on what we can agree on and seeking consensus. We may not agree on the right solution but that's okay because there won't be one single solution - it will be a combination of many - it's more important to agree on a direction. A clean renewable, post fossil fuel future. It is about informing, persuading, inspiring and influencing those around us. Our friends, neighbours, colleagues, society and the world at large. Which brings me to the inspiration for this piece - a post by the Engineer Poet looking at the future of aviation once the cheap oil has run out and the discussion continuing in the comments section. It's just one example of people coming together to focus not on the problem, but on possible solutions. Many people are looking for and providing solutions. Conservation and the emerging green business attitude make the scenario less bleak than it feels. The problems are big and the people making solutions are aware of that. One oil based thing I like is www.somender-singh.com where a lone Indian inventor has made significant progress in internal combustion engines. I just got the latest Sierra Club Magazine. If you get the chance read the article by Carl Pope. His message is that engineers can solve many of our environmental and energy problems if we direct them to solve them. But instead, they are often directed to work on things that benefit the few, rather than the many. I certainly can't express it here as well as the article does. But I too have faith in science and technology's ability to solve world problems, when it is focused on doing so. Not only the world's leaders are needed, everybody can have his say. PLease have a look at the homepage and sign the "Declaration of Independence from Oil". The JumpstartFord campaign eventually calls to Ford Motor Company to lead the auto-industry to Zero-Emission-vehicles by 2020. As a mean of phasing out our addiction to Oil and to renewable energy sources. Thanks for turning me onto the Engineer Poet--loved reading that site! I have felt fairly pessimistic about the future, especially with the way our current administration is heading, but I am a bit hopeful that things *have* to change and we have to head towards clean energy solutions. I am continually surprised at how many people have decided that energy producers will manage to develop less costly means of powering your lifestyle before demand exceeds supply. Only you will do that, when the cost to maintain your supply exceeds your ability to pay for it. Of course, as usual, wealth will allow you to delay this realization, but will not prevent it. Oil is nowhere near that price, and the market will ensure that a timely transition will occur. It will not occur when you think it is too expensive, like right now. It will occur when it IS too expensive, which I can postulate will be around 6 or 7 dollars per gallon, in todays dollars. I'm guessing that level will occur in 10-20 years. Our MPG per consumer vehicle, (not CAFE) will be around 40 MPG. If you extrapolate the convergence of these numbers, it is around $3.50 equivalent per gallon, vs todays 2.25 per gallon. Isn't it intersting that while used SUV prices have declined about 10% in the last year, they still account for almost 35% of all new vehicles sold. That tells us that we are not approaching a prohibitive cost to operate threshhold. When we do, average household MPG will go up, oil prices will not go down. When we have reached the technological limits of combustion efficiency, the progression will intensify, and new lifestyle parameters will have developed, and they will not include the consumption of oil. Fear (or rational planning) that oil companies are going to raise prices to slow consumption are pipe dreams, rooted in the idea that government can somehow make an asset, and they can control it's distribution and pricing, and the motivation for doing that will be beneficial to consumers. It won't, and the benefit is to be had by doing exactly the opposite, by removing all incentives to companies exploit oil. This may have been suggested already, because I've never been here, but what if we could design a car that ran on solar or wind power? They already have cars that makes water as it's waste, and I've seen a working solarpowered car, but the wind will always be there. If we could design a car that could run on wind, we wouldn't have to worry about night, because we don't need sunlight, and would we need a waste? I'm not sure, but wind might be the win-win scenario here. There's already a car which runs on solar energy or wind power. It's an electric car. well these really neat fantastic electric cars your talking about...have to charge a lot, where it actually is cheaper and easier for most people to actually use gas. And these cars are highly expensive, and over 1/4 of our population, can not afford these cars. Ethonal fuel is not the answer either, aw well as elctric cars, you can not drive as far of long as well as you can a gas car....which is why america relies on gas, because it is much more efficiant.